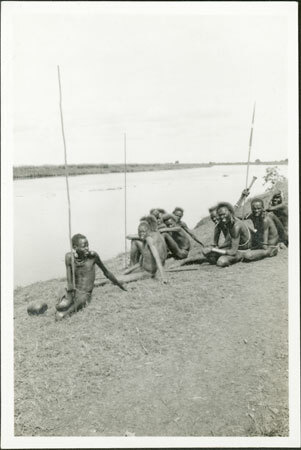 A group of young men sit on the bank of a large river, probably either the Sobat or Bahr-el-Ghazal. Two of them to the right are wearing long ear ornaments, and one of them thiau arm bands. Note on print reverse ms pencil - "[? ]64/3"
Morton, Chris. "Nuer men beside river" Southern Sudan Project (in development). 03 Jan. 2006. Pitt Rivers Museum. <http://southernsudan.prm.ox.ac.uk/details/1998.346.316.2/>.